MAVEN has successfully entered the fourth deep-dip campaign of the mission. 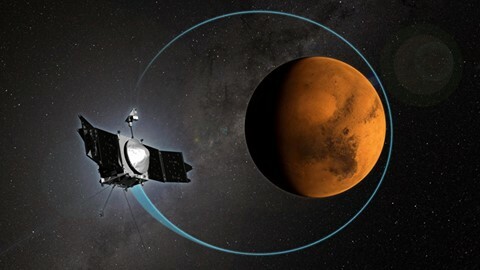 Two maneuvers executed over the past two days have placed the ‪#‎MAVEN‬ spacecraft into a deep-dip corridor, with a periapsis altitude of 121.2 km (75.3 mi), where ‪#‎Mars‬‘ atmospheric density is 2.2 kg/km³. At a periapsis latitude of 65.7ºS, this deep-dip campaign will provide coverage of Mars’ south polar region. This animation depicts MAVEN maneuvering from its normal science orbit to the deep dip orbit and back.